Speed up design and sales cycles and get projects funded faster with a turnkey 3D design and print solution for all your proposals, presentations, and sales centers. Upload your 2D assets or 3D files and leave the rest to us. 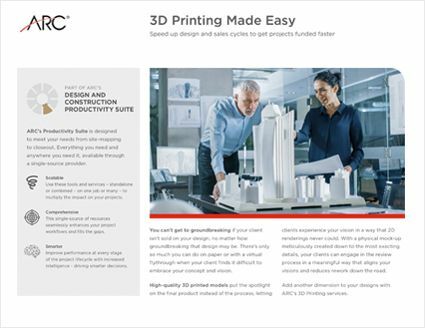 ARC’s 3D Printing platform is your all-in-one solution for best-in-class 3D models that wow your clients and ensure your presentations stand out from the crowd. Cut weeks off of review cycles, shorten your sales process, and get to "yes" faster when you transform your vision into a concrete reality that clients can see, feel, and believe in. Skip the brochure. High-quality physical models allow your clients to see what they’re paying for, making it easy to sell designs to owners, developers, and the public well before construction begins. 3D architectural models allow you to clearly communicate your design, increase alignment between you and your clients, and reduce rework. Don’t let your vision get lost in translation by using 2D drawings or CAD presentations! Shorten the design cycle with greater flexibility to quickly experiment and present more accurate project depictions. Using stunning 3D models as reference points, you, your team, and clients can close out the review process sooner. Transform your CAD, cutaway drawings, or design files into stunning 3D models that are shipped directly to your door. You can’t get to groundbreaking if your client isn’t sold on your design, no matter how groundbreaking that design may be. There’s only so much you can do on paper when your client finds it difficult to understand your concept and vision. You could go back to the drawing board, or you could save time and skip the drawing board entirely. High-quality 3d models put the spotlight on the final product instead of the process, letting clients experience your vision for themselves in a way that 2D renderings never could. With a physical mock-up meticulously created down to the most exacting details, your clients can engage in the review process in a meaningful way that aligns your visions and reduces rework down the line. 3D printed models enrich AEC projects from concept to completion and offer a fast, affordable way to get an objective look at your plans every step of the way. Massing Models: There’s no denying the critical role that model making plays from even the earliest, conceptual phases of design. 3D printed massing models can save you hours of time and allows you the flexibility to edit your files and re-print your changes easily while giving you time to work on other essential tasks. Construction Models: 3D print detailed models of even the most complex of structures to test its feasibility and provide a more accurate and comprehensive representation of your design’s form that your team and clients can analyze and explore up close. Model Homes: House plans come to life and allow potential buyers and city planners to experience a single unit or an entire development, and provides contractors with a precise image of the results you expect to see. 3D Floorplans: Create easy-to-understand models of interior floorplans that anyone can comprehend, leading to faster revisions and approvals. 3D printed floorplans save you the time and money associated with hand-built models while producing plans that streamline communication by providing a detailed and intricate representation of your vision that helps shorten review cycles and avoid rework. Interior Models: Design interior spaces with a greater ability to explore and experiment with the prohibitive restraints of conventional measures, resulting in spaces that are tailor-made and fully optimized for your client’s needs. Architecture Models: 3D printing offers a cost-effective solution to quickly creating complex architectural models to scale that you can easily edit, so that you can explore and test every design element, all while shaving weeks of time off of your schedule. Piping Models: Piping routing, connectors, and materials are laid out in an easy-to-visualize manner with 3D printed piping models to help engineering teams optimize every project for the most effective use of space while ensuring maintenance access and avoiding overlap. 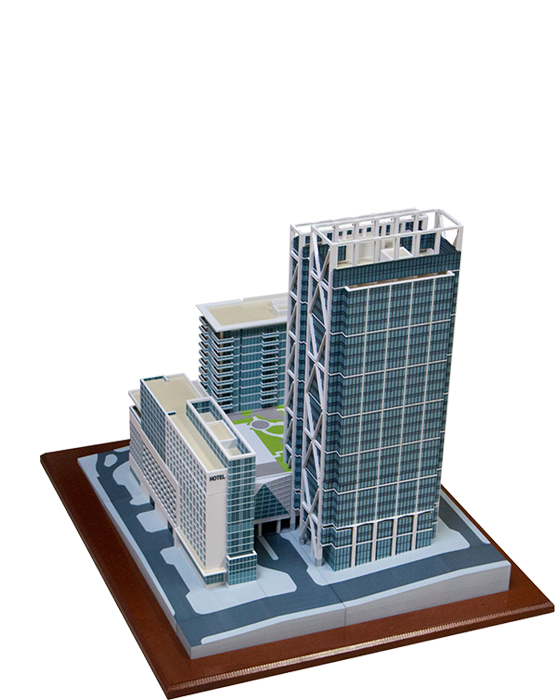 Scale Models & Stakeholder Gifts: Create scale models of a single project or an entire city to represent any stage of your build to use in the design process, in presentations or sales meetings, or even for use as stakeholder gifts. While 3D printing has been in use for decades, the surface of its potential has merely been scratched. New applications for 3D printing technology are being uncovered faster than ever before, and those in construction, architecture, and engineering are finding much-needed budget and time savings as they find new ways to incorporate 3D printed models into every aspect of their projects. Get scaled models from any standard architectural asset, including blueprints and 2D renderings. Avoid the cost-prohibitive challenges of creating 3D files for printing when you partner with ARC to print your 3D models. Our streamlined, turnkey process is a start to finish solution to bring your designs into the world. Our expert team can repair your 3D files or create them for you using just your 2D assets. You have control of your design from start to finish, and can view renderings and work directly with your project designer to review digital proofs before printing commences. Only after you’ve given your approval will we send your file to print, so you know that the model you receive will meet your exacting needs. Use ARC’s 3D printing services to produce high-quality, multicolor models of any shape or size. Our 3D print experts will work with you to iterate on your vision or design a model from scratch until it’s showroom-ready. Sales meetings, trade shows, project status updates; whenever you need to put your best foot forward and showcase your design, 3D printed models are a cost-effective, time-saving solution. Variables such as size, durability, detail, and accuracy all play a crucial role when choosing the right printer. ARC offers an extensive range of printing processes, including ColorJet, SLS, and SLA, allowing us to match your precise needs with the optimal method and hardware for the job. ARC 3D models are created using the most advanced 3D printers available today. Our team of expert designers has access to the latest in 3D printing technology and, just as importantly, they have the experience and insight to choose the best process, printer, and materials for each job. Many firms who purchase 3D printers for onsite use find that only some of their needs are met by it and that it often ends up too costly to stay at the forefront of emerging tech. With ARC’s 3D printing services, you gain access to the newest technology in 3D printing when you need it without the overhead of an onsite fleet of printers. Customize your 3D printed models using the materials that best suit your unique project requirements. Whether you require durable, single-color nylon or plastic; or high-detail, full-color printing, ARC’s 3D printing team will get it done. Produce the perfect scale model, prototype or fixture for your clients by choosing the right materials every time. Our fleet of architectural designers remains at the forefront of the fast-evolving 3D printing technology field to help you conceptualize, design, and produce 3D printed models using any of the hundreds of different available materials to meet your needs best. Designed to meet your needs from site-mapping to closeout. Everything you need and anywhere you need it, available through a single-source provider. Click any service on the wheel to learn more. The most current project information at your fingertips. Easily meet your visualization and BIM requirements. Aerial intelligence for smarter construction. Clearly communicate your architectural design. Identify design and constructability flaws and ease document navigation. Improve communication with seamless team connection. A better way to finish the job with a Mobile Closeout Dashboard. Find the info you need in seconds, not hours. We are extremely happy with the end result. The raw material suggestion far exceeded my expectations. We will certainly be using this service again.